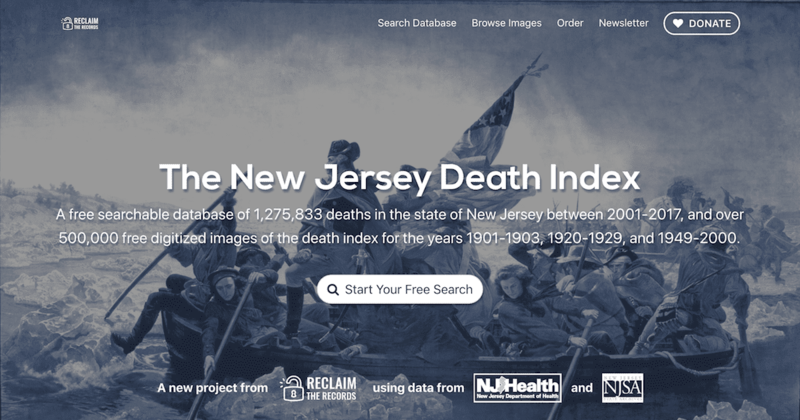 Your one-stop shop for everything you ever wanted to know about the New Jersey Death Index, with a searchable database of over 1.2 million records for 2001-2017 and direct links to over 500,000 digital images for the not-yet-transcribed 1901-2000 data. It's all there and it's all free, free, free! So, just to be clear, the following years of the New Jersey death index are still missing at the moment: 1904-1919, half of 1920-1924, and 1930-1948. We at Reclaim The Records have reached out to the awesome and helpful people at the New Jersey State Archives in Trenton, and it seems likely that we may be able to get some of the missing years of data from them, although maybe just the early years. We're planning to order microfilms copies from them, then scan those films, and then put that missing data online. But this probably won't happen for another few months. That means that we might be able to get some or all of 1904-1919 and/or the missing half of 1920-1924 online in a few more months. We'll know more details about the exact years soon. But that would still leave 1930-1948 as missing any index at all. So we're also going to keep working with our attorney to see if we can somehow force the New Jersey Department of Health to recreate those missing years of the index. We can't ask them to do that under OPRA, because the law doesn't require an agency to make a new record, only to release what records they have. But maybe the New Jersey vital records law or some other law can help us out here, since perhaps we could prove that the state has neglected something they're required to do. This tactic may or may not work, but we think it's at least worth a try, and we'll let you know how it goes. Quite a lot! Some years of this death index have more fields of data available than other years, and it tends to get more helpful the more recent the record is. For example, most of the years of the index will at least give the age at death, from which you can infer an approximate birth year, but the later years of the index (after about 1985) also give the deceased person's exact date of birth. Some of these records give a numeric locality code for the place of death and/or the place of residence of the deceased. To translate those codes into the city or county names, use this locality list for 1949-1984 or this locality list for 1985-present. Unfortunately, the official key to the locality codes that was used prior to 1949 seems to be yet another file that has been lost by the state. But don't just wait for us to tell you about the data -- go see for yourself at www.NewJerseyDeathIndex.com! We want more records! Please help us reclaim them? If you like our work and our activism, we hope you'll consider making a donation to Reclaim The Records to say 'thanks' and to help us fund more of this kind of work. We became a 501(c)(3) non-profit organization last year, and public support for our projects is crucial to our continued work. And we're happy to announce that a generous anonymous donor has recently stepped forward to offer our first-ever matching gift! Our donor will match the first five thousand dollars that Reclaim The Records raises by October 15, 2018. That means that your donations can be doubled, and this new funding can go towards more litigation, more open records advocacy, and more activism. Please help us take advantage of this generous matching offer, and donate today. Your support is very much appreciated! Frankly, what Brooke Ganz and her team have done over the past few years in obtaining and putting online New York and New Jersey records is amazing. Well done, team! * Indexed 2001-2017 Death records at the top of the page using the search engine. * Browse image links for the other years on the page below the search engine (use the "Browse images" link, or scroll down). There is no index for these records - you will have to open the image file and visually search them. Many of these records do not have the full death dates or birth years/age at death. However, something is better than what there was before!